It wasn’t a war scene that Barbara saw out of her window. It was an accident that involved six cars, and left three people including a pedestrian hospitalized. A white Infiniti QX56 was one of the vehicles now plastered against the fence. It was also the culprit in the accident, according to witnesses and emergency responders. The owner of one of the vehicles damaged, a Mercedes S550, said he was driving southbound in the right lane on Ocean Avenue when he saw the Infiniti speeding north down the striped median, heading for the left turn lane. He estimated the car was doing about 60 miles per hour when the driver swerved into oncoming traffic. The Infiniti slammed into a maroon Nissan Altima, leaving a chunk of his bumper in the Altima’s windshield and ripping open its side. The Altima nipped the Mercedes, while the Infiniti continued on. It careened into a row of park vehicles, nicking one and tossing the other – a BMW 525i – into the same gate that eventually forced the Infiniti to come to a halt. An Acura parked behind the BMW took a chunk of the momentum out of the impact, crushing its hood. The driver and passanger of the Altima were hospitalized, as was a pedestrian on the sidewalk. But it’s nothing new to that intersection, according to Barbara. The corner is an accident hot spot begging for some Department of Transportation relief, she said. It’s no secret that City Councilman Lew Fidler is not one to coddle bike lane advocates. The pol has been painted by bicycling enthusiasts as a car-crazed obstructionist hell-bent on keeping his district’s yokels addicted to gasoline. 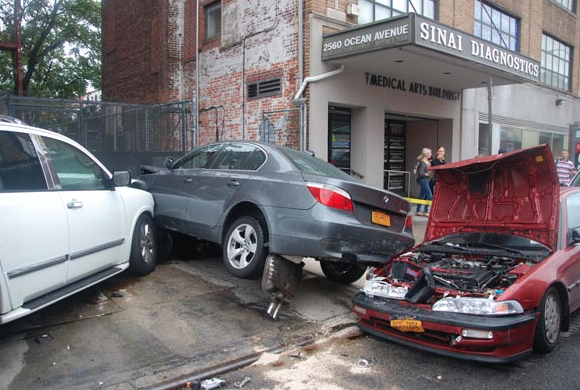 But to locals, he’s a bit of a savior, winning over Community Boards and civic groups in his district by blasting the Department of Transportation’s misguided installation of bike lanes in awkward, unsafe and unwanted areas. Sheepshead Bites and Queens Crapper should both follow their hearts and move to Ronkonkoma. On urban transportation, they have all the logical coherency of a Mercedes-Benz crashing into an ivory tower. I recall from Streetsblog a few years back that Clown Fidler’s oil-war chariot is an “Infiniti”. I do hope he wasn’t (directly) involved in this violent, pedestrian-injuring crash! It’s amazing how much some people in these neighborhoods, including bloggers and reporters, have in common with the conservative right. They demonize government agencies over and over again until they need those very agencies to help them. Like Rick Perry trying to have it both ways when he wants lower taxes and less government interference in Texas, but greater FEMA support for his state’s wildfires and stepped-up CBP presence along the border with Mexico, the anti-DOT crowd is more than happy to call on DOT to help them when a car crashes through a storefront in their neighborhood. Fidler and Sheepshead Bites doesn’t want the DOT to tell them what to do in their neighborhood, but they’re perfectly happy supporting legislation that will limit what the DOT can do in mine. That’s another thing they have in common with conservatives.